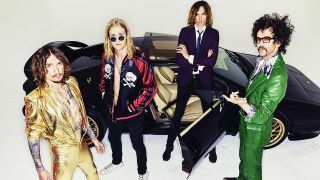 The Darkness have announced that they’ll release a new album later this year. It’s titled Easter Is Cancelled, and it’s set to arrive on October 4 via Cooking Vinyl. It’ll be the UK outfit’s first studio album since 2017’s Pinewood Smile, with the band revealing the news through a video message. The band have also said they’ll head out on a UK and European tour from November, with details to be revealed next week. No tracklist has been released, but the cover art can be seen below, while pre-orders are currently available here. The Darkness will play at this year’s Teddy Rocks festival which will take place at Charisworth Farm, Blandford, Dorset, between May 3-5, with organisers and artists coming together once again to raise money for Teddy 20 – a charity set up to help children and young people fighting cancer.